Neutral impact is expected on ports and last-mile delivery players if the East Coast Rail Link (ECRL) is cancelled or delayed, according to analysts. This is due to the complexity of costs of intermodal logistics to be borne by companies in having to use other transportation such as trucks to transport cargo to rail, said Malaysian Industrial Development Finance Bhd (MIDF) research analyst Adam Mohamed Rahim. “Even though the ECRL claims to take a shorter time to transport rather than solely using ships passing through the Strait of Malacca, the cargo volume using a ship is way higher than using the railway. “For example, ships from China unload cargo at Kuantan Port and then may use trucks to transport to rail. The railway then carries the cargo to Port Klang and when unloaded, it will need trucks to transport the cargo from rail to port. “This process will incur higher charges for the companies than by using ships,” he told Bernama. In short, he said it would be better to just use direct shipping rather than going through the trouble of unloading and loading cargo on to trucks and railway. 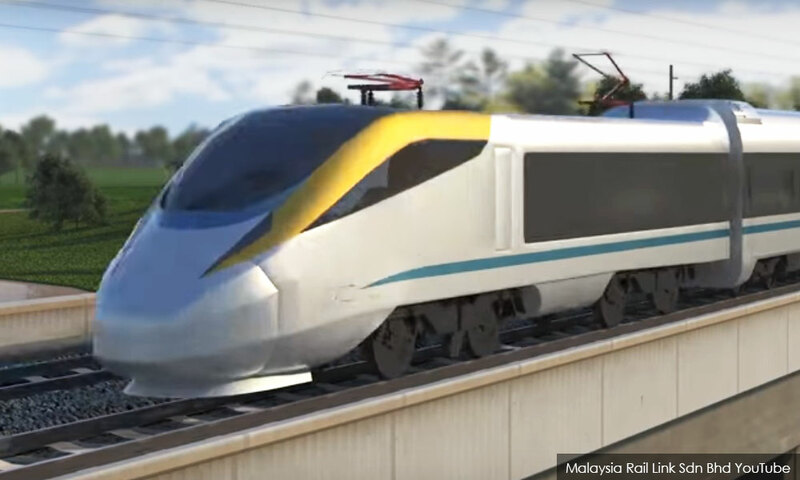 Recently, the new government said that the decision to defer or terminate the RM55 billion ECRL project would be announced after reviewing the project. The 688-km rail link, if built, will connect Port Klang in Selangor and Pengkalan Kubor in Kelantan and will be constructed in two phases. Based on the previous government’s (BN) estimation, the ratio of passengers to freight is expected to be 30:70. By 2030, it is projected that 53 million tonnes of cargo are expected to use the ECRL service annually as the primary transport between the east and west coast of Peninsular Malaysia, and vice-versa. However, the freight cargo projection of the rail network is in contrast to the total cargo volume running through the entire Malaysian railways, as in 2015, only 6.21 million tonnes of cargo were carried by rail. Meanwhile, another analyst who wished to remain anonymous said more shipping companies, especially those involving container lines that control more than 60 percent of the global market, are currently shifting towards using bigger container ships. Consequently, the railway does not seem to be a convenient mode of transport to carry those larger cargoes due to space constraints, he explained. He said the big container lines also were moving towards using the biggest ships with capacities of 18,000 TEUs (twenty-foot equivalent units) against the current 10,000 TEUs. “Using such bigger ships allow the companies to move more cargoes in a single journey compared with using railway or other transportation,” he added. The ECRL is the only megaproject that has not been cancelled and will be further studied by the government. Previously, two major transportation megaprojects, namely the Kuala Lumpur-Singapore High-Speed Rail and Mass Rapid Transit Line 3 projects, were officially scrapped by the government to control the national spending and debts.